A massive earthquake has hit the coast of southern Peru. A tsunami threat has been issued in Peru after a powerful earthquake struck just off the coast of South America. The 7.3 magnitude earthquake struck about 124km south-west of the town of Puquio, the US Geological Survey (USGS) said. Officials in Peru said there is a tsunami alert for areas within a 300km radius of the earthquake. 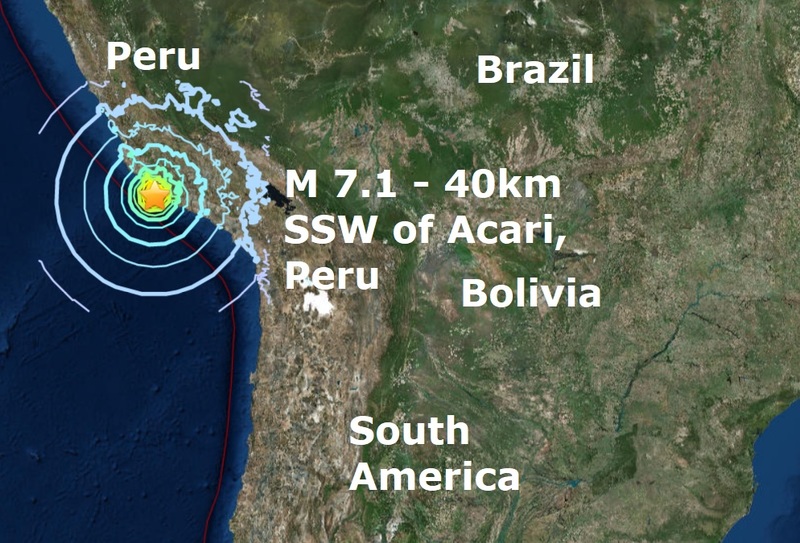 According to Peru’s government Geophysical Institute, the earthquake was of magnitude 7.3 reduced to 7.1 with its epicentre in Lomas, in the southern region of Arequipa. Kp is an excellent indicator of disturbances in the Earth's magnetic field. The powerful quake happened as a G1-class geomagnetic storm is in progress as the Earth enters a fast-moving stream of solar wind from a coronal hole on the Sun. The gaseous material is flowing almost 600 km/s (1.3 million mph) from the hole in the sun's atmosphere. NOAA forecasters estimate a 40% chance of continued G1-class storming on Jan. 14th as Earth moves deeper into the stream of solar wind. Today's major quake is the third this week and the third of 2018.